As a guitarist, sooner or later comes the question of the volume balance between rhythm and lead tones. You probably all know the devastating feeling of playing the best solo of your life only to be told later on by members of the audience that nobody could hear it! In 2010, one could think this is a trivial problem but it is not. This is essentially due to the fact that a volume or gain modification anywhere in an effect chain can have a big effect on the overall tone. Unless you are a rock star and your sound engineer knows exactly when to boost your volume, there is a number of solutions to this problem that I will list in this post. The first solution that comes to mind is of course to use the volume control of your guitar. After all, why is there one? The problem is that reducing the volume of your guitar will reduce the amount of signal sent to your pedals and amp thus directly change the amount of distortion/overdrive in your tone. It can fit certain styles like blues rock where rhythm work is not as dirty as lead work. For instance, Jimi Hendrix made use of this extensively on stage: he could go from clean to dirty just by manipulating the volume of his guitar (note that the stratocaster is especially good for that). It also works well if you are more of a clean tone player. Using a volume pedal at the beginning of your chain is the same thing as using the volume of your guitar except it might be more progressive. You will have the same problem though: reducing the volume will reduce the amount of overdrive or distortion from any device placed after. Another solution is to use an amplifier with 2 master volumes or 3 or more channels so that you can dedicate some of them to rythm work and some of them to lead work: usually these amps are not the cheapest and offer slightly different tones depending on the channel but they can be a good solution. For example, the high end models of the Marshall JVM series feature 2 master volumes and are programmable which makes them very flexible. Note that for those of you who need tons of distortion for their rhythm tone, a lot of 3 channel amps (especially those made in the 90s) won’t cut it since the middle channel is often tailored for crunch tones rather than devastating ones. This is a very flexible solution: you can set the volume of one pedal in “rhythm mode” and the one placed after in “lead mode”. In lead mode, you can have the two pedals together for more gain or just the lead pedal. It can be tricky to switch from rhythm to lead but it is doable especially with BOSS or Ibanez pedals which have a large switch. One stomp and you can switch off a pedal while switching on the other one. Combining two overdrive/distortion pedals is a broad topic in itself and I will soon post about it. A few recent distortion/overdrive pedals feature a “boost” switch to increase the volume for lead work, check out the Satchurator and the upcoming Ice 9 overdrive designed by VOX for Joe Satriani or the ZVEX box of rock. Those of you with super sophisticated gizmos don’t have much of an issue since you can program rhythm and lead patches. They can even sound good plugged straight into a PA. This is not something that purists love but I have used my Line 6 Pod straight into a PA for gigs with very good results. If you play against a clean amp and all your overdriven tones come from pedals, this is by far the easiest solution. A clean boost pedal will take the signal and make it louder without altering it. 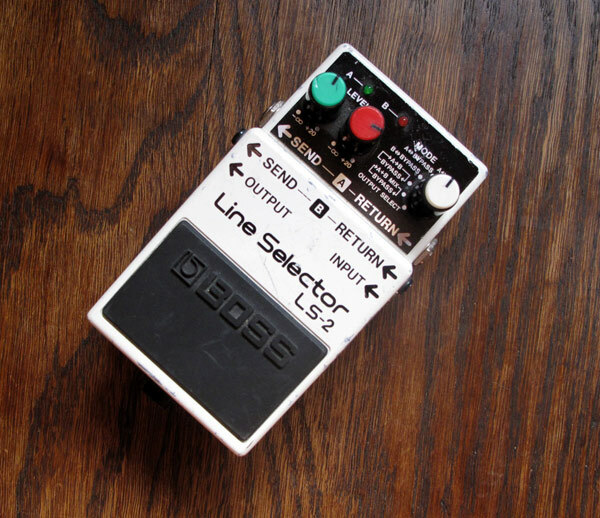 I personally use a BOSS LS-2. The LS-2 can also be used as a looper to switch between 2 chains of effects or use them in series, each chain having its own volume. 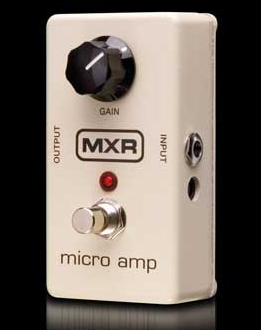 I have heard the MXR micro amp is also pretty good placed after a chain of effects to increase the overall volume, not to mention all the boutique clean boost pedals. I stress that you need to have a clean amp with enough headroom because otherwise the extra volume might make the amp clip (which can also be a cool effect). Alternatively, most equalizer pedals feature a general volume control and will be able to get you a nice boost, check out the BOSS GE-7 or MXR 10 band EQ. And of course, you can also use a good old volume pedal but at the end of the effect chain rather than at the beginning as mentioned earlier in this post. If your dirty tone comes from your amp, it is a bit trickier. People have had good results using a booster and or a volume pedal in the effect loop providing your amp offers such a facility. Be careful what kind of pedal you use. Most of them are OK but some of them won’t work in an effect loop since the signal strength is too different from a guitar output (check out the impedance). Check also that your effect loop has an adjustable level because in this case it will probably adapt to any pedal. The beauty of this “end of chain” boost solution is that you can boost either your clean tone or your distorted tone which gives you a wide variety of tones for soloing. Note that placed at the beginning of the effect chain, say right after your guitar, a clean boost pedal will have a different effect. If it is placed before a distortion/overdrive pedal, the more gain is dialed, the less the clean boost will have an effect on the overall volume, it will rather have an effect on the amount of distortion (this is because a side effect of distortion or overdrive is that the tone gets compressed). With a moderate amount of gain on your overdrive/distortion stompbox, a clean boost will fatten your tone and moderately increase the volume which is like going from the crunch to the lead channel on a 3 channel amp. As always when unsure, just experiment! Solving the lead volume issue is linked to your style of playing and one or several solutions amongst those I have mentioned in this post might be available to you. And don’t forget that the volume is not everything and your tone will have to cut through the mix as I have explained in a previous post. Also you might want to check another one of my posts about the use of compressors at the end of your effect chain, it is a possible solution to boost your volume for solos although I have not always found it workable in live situations.